Manilva the most westerly municipality of the Costa del Sol, approximately 100 kilometres from Malaga, the town itself at 128 metres above sea level, Manilva is situated at the far south-western end of the province of Malaga, 97 kilometres from the city of Malaga and 35 from Gibraltar, bordering with the province of Cadiz. It is the meeting point between the Costa del Sol and the Campo de Gibraltar. The village itself, situated between the River Manilva and Calataraje stream, is 128 metres above sea level and the mean annual temperature is 18ºC. The surrounding land is hilly, the terrain consisting of terraces that rise up gently from the sea, built on the hills of Peñuela, Estanquillo, Indiano, Alcorrín and Martagina. The town is built on one of these hills, Los Mártires. This means that the municipality is equipped with facilities for both beach and rural tourism. Manilva currently has 5, 192 inhabitants, who live in five separate areas: Manilva, Sabinillas, El Castillo, Hondacavada and El Puerto de la Duquesa, as well as numerous housing developments.The municipality’s great fishing tradition is in evidence every day at its wholesale fish market at San Luis de Sabinillas, on the coast, while the area is also marked with natural beauty, from Las Lomas de Miraflores to Don Pedro. Nowadays Manilva’s impressive urban growth lives side by side with typical traditions, such as the treading of the grapes in September, announcing the next vintage of muscatel wine. The economy is based on agriculture, mainly muscatel grapes, fishing and tourism, the last of these being of fundamental importance in recent years. The cuisine of the area is typically Mediterranean: simple and healthy, with ample use of olive oil and fresh fish and seafood. The products of the earth are extensively used too, such as grapes, honey, cheeses and local wines. Of special interest to gourmets heading for Manilva is the asparagus soup, the fish cooked with almonds, the cod cakes, the fried anchovies, squid and other delicious fish dishes. Also made locally are the various pastries and grapes in aguardiente. Spanish cooking. Ctra. Nacional 340 Km. 545, Manilva. Barbecued meats. Ctra. Nacional 340, Manilva. International cuisine. Puerto de la Duquesa, Manilva. Mediterranean cooking. Cno. de los Baños, Manilva. Greek cooking. Puerto de la Duquesa, Manilva. Puerto de la Duquesa, Manilva. English cooking. Puerto de la Duquesa, Manilva. Fish and seafood. El Castillo de la Duquesa, Manilva. Specialising in meat. El Castillo de la Duquesa, Manilva. Fish and seafood. C/Boquerón el Castillo, Manilva. Fried fish and seafood casseroles. C/Pescadores, 3, Manilva. Manilva is well known for its many festivals throughout the year. The carnival takes place in February, finishing on the last day of the month, the Day of Andalucía. The Romería of Nuestra Señora la Virgen de Fátima is on June 27th, with the traditional procession to the Hermitage of San Adolfo en los Baños de la Hedionda. In July there is the festival in honour of the town’s patron saint, the Virgen del Carmen, which takes place in the Castillo de La Duquesa area, and the Festival of Santa Ana is held on July 26th. The Festival of San Luis de Sabinillas, in honour of its patron saint, takes place in August with the image of the saint carried through the streets in procession, and as soon as this event is over, another begins. This is the traditional Grape Harvest Fair, with horse racing, competitions of various types, a special mass and the procession of the Virgen de Los Dolores. The traditional stamping of the grapes takes place during this festival, and the first wine of the new season is tasted. A route through the town centre can begin with a visit to the tourist office itself, the Villa Matilde, which once belonged to Ignacio Infante, uncle of the father of Andalusian nationalism, Blas Infante. It has recently been restored and houses a number of Roman remains found in the Manilva area. 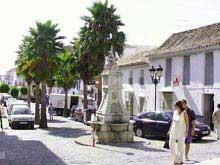 Following the road from here, one can see the parish church of Santa Ana, dating from the 17th century, the calle Mar and the calle Iglesia. The route of the Molino del Duque begins with the mill itself, currently lived in. One can then visit El Ignenio, the 19th century La Bodega, la Charca de la Mina, with Roman and medieval remains, and finally, Los Baños (the Baths) and the Canuto de Manilva. The El Castillo (Castle) route begins in Sabinillas with the Torre de la Sal and the Colonia, which is sometimes referred to as the Factory, an agricultural centre and sugar factory. From here one can visit the Castle, an 18th century fortress, the Ingenio and the towers of La Chullera. The task of keeping watch on the coast, with its eight kilometres of beach, has not ceased with the passing of the years. For this reason, Castillo de Sabinillas or Castillo de la Duquesa (the Duchess’s Castle) was, until very recently, the police and Civil Guard headquarters. The reason for this is that the coast is very straight here and so the whole stretch can be seen from the castle. The current castle is not the original one, either, and replaced an earlier edifice, a fortress that was used for defence in the first half of the eighteenth century, when the British took Gibraltar during the War of the Spanish Succession. La Cala de la Sardina is one of the most tranquil and least crowded beaches along the seven kilometres of Manilva coastline, and is an ideal place to fish from. La Duquesa(5*). Club de Golf la Duquesa, Manilva. Hotel Doña Luisa. Duquesa de Arcos, Manilva. Hostal Casa Recio. Duquesa de Arcos, Manilva. Hostal Buena Vista. Plaza San Luis de Sabinillas, Manilva. Hostal Miguel Sabio Romero. Avda. Manilva . Pensión Francisca Rosas. Plaza Iglesia, 9, Manilva. Pensión José Ocaña. C/Mar, 12, Manilva. As far as the past is concerned, the origin of Manilva goes back to the end of the Neolithic period, as evidenced by remains found in the Sierra de la Utrera, as well as twenty archaeological sites from the end of the Bronze Age at Cerro del Castillo. Nevertheless, the exact moment of the first settlement was during the Roman occupation, as can be seen by the villa at San Luis de Sabinillas. In addition to this villa there are also the remains of Roman baths and a tower on the hill known as El Hacho, as well as ceramic walls found at Haza del Casareño, Las Lagunetas and in the village of Manilva itself, all constituting further evidence of the passage of the Romans through this land of vines of muscatel grapes. Medieval remains found in the area include those of La Alcaría, El Cerrillo de la Sepultura, El Cerro del Tesorillo, the Torre Almenara (Minaret tower) de Chullera, dating from before the re-conquest, and the Torre de La Duquesa. Later, from the sixteenth century, the history of Manilva went hand in hand with that of neighbouring Casares, since in those days it formed part of the county of Casares, which came under the protection of the Duke of Arcos. This situation arose from a military strategy to protect nearby towns, such as Marbella, Gibraltar and Ronda. The request for protection and surveillance was dealt with by Charles V, who in 1528 issued the orders for a tower to be built, known as the Salto de la Mora (Moorish woman’s leap), where a few years later over 50 neighbours created a farm community on a hill called Los Mártires (the martyrs), which was to become El Cortijo, the origin of the present town of Manilva. At almost the same time as the farm community was starting up in 1530, the church of Santa Ana (St Anne’s) was built, under the auspices of the Duke of Arcos. The image of “Santa Ana la vieja” (the old St Anne) stood in this church but was destroyed during the Civil War in 1936. The effigies of Nuestra Señora del Rosario (Our Lady of the Rosary) and el Santo Cristo de la Mar (the Holy Christ of the Sea) also used to stand in the original church. This building disappeared in the 1722 earthquake and was substituted in 1776 for the current one, which stands in Calle Iglesia. Nevertheless, despite the gradual growth of the population, it was not until October 26th 1796 that Manilva obtained its independence from Casares, being granted the “royal privilege of town”, and bringing, finally, a long drawn-out lawsuit with the neighbouring village to an end. The original building was built using some old walls left by the Romans that were barely a metre and a half in height. Both a cavalry and an infantry detachment were posted here and in addition there was a hayloft, a kitchen and a chapel. This fortress was abandoned when the castle was built and later it was used as a country inn in the nineteenth and twentieth centuries. The land is currently used as a football ground. Thus, the history of the area through its buildings tells of a Roman past and a people who had to fight foreign invasion right from the time of the very first settlement. However, with the passage of time it has developed a tourist trade which has benefited the whole area. Without a doubt this village continues to cast a spell, with its mild climate, its natural beauty and its good wine.